Talk about a nail biter! 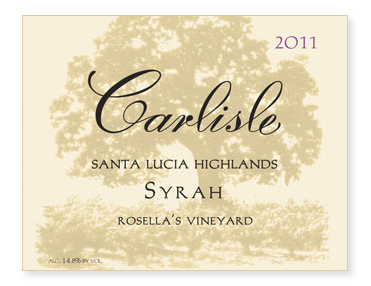 Rosella’s Vineyard is about as far north as possible for growing Syrah in the Santa Lucia Highlands. Any further north (i.e., closer to the fog and wind of Monterey Bay) and consistent ripening would become an issue. But in this exceedingly cool vintage, even here at Rosella’s we wondered if the fruit was going to make it. Sugars progressed at a snail’s pace throughout October. With shortened days, cold nights, and rain forecasted November 3rd through November 6th, we decided to pull the trigger and picked on November 2nd. Sugar was a healthy 24.5 Brix and the juice tasted amazing. Phew! We made it! Twenty-five percent whole cluster. Twenty-one days on the skins. Twenty percent new French oak and bottled unfined and unfiltered. One of my favorite Rosella’s to date.